If you’re involved in traditional media and your mind wasn’t boggled by last month’s IDC report, “The Digital Universe in 2020,” it must be that you didn’t see it. So let’s take a look, and then let’s consider the implications. 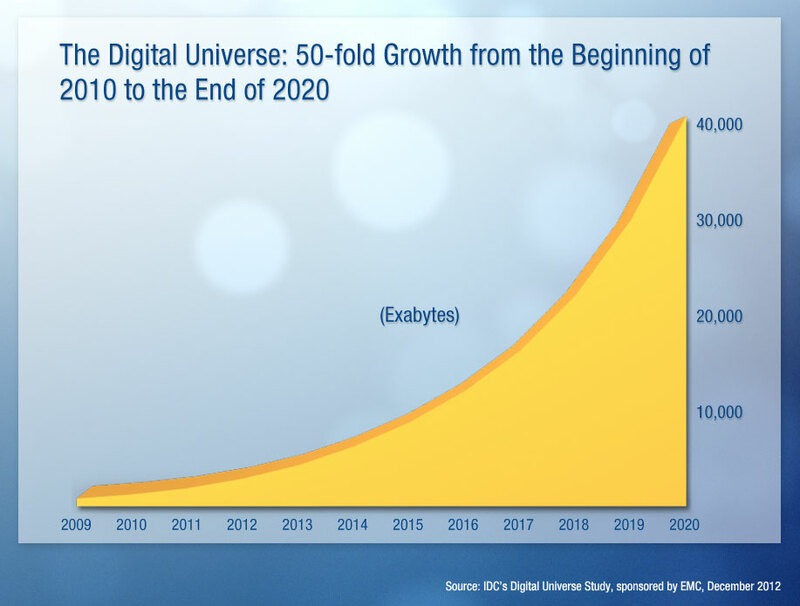 Each year, IDC — a division of EMC — attempts to estimate the amount of digital data created, replicated and consumed that year, and to project the growth likely in the “digital universe” by the end of the decade. Here’s the knockout punchline: IDC predicts there will be 50 times as much digital information in 2020 as in 2010. We’re in the red-outlined section of the chart now — the IDC report confirms it. Think we’ve got Big Data now? We ain’t seen nothin’ yet. Picture a planet-full of people using digital devices to read, view, listen to, send and receive digital information. Picture those digital devices in the hands of more and more of the population, used throughout their waking hours. Picture them searching for things they’re interested in; picture them sending messages, photos, videos; picture them shopping, posting, pinning, sharing and doing all the other things people do with digital data. When people use digital data systems, their usage itself generates data about them. Picture each digital action creating data about who the person is, what interests her, what he is likely to spend money on. That layer of meta-data — not just the sheer volume of information that will becoming available — is the big game-changer for traditional media. These data have huge commercial value, some of which is in its tremendous power for targeting advertising and marketing. As more and more of those data are captured, analyzed and made actionable, it becomes less and less necessary to fire advertising blindly into the crowd using mass-media solutions. Instead, by using real-time bidding informed by Big Data, advertisers can target the specific individuals they want to reach, one impression at a time. I call it the “Where’s Waldo” game. This will disrupt the mass-media business model further and further. 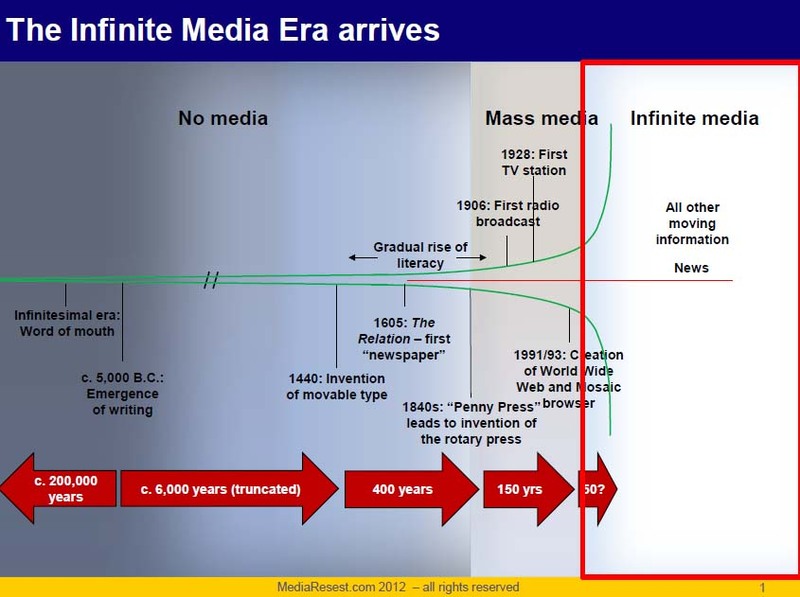 The content we generate will be an every-smaller share in the ever-expanding ocean of information choices. Gaining audience dominance will get harder and harder for individual media sources. Already we’re seeing that local news providers are getting less than 1% of the digital visits from people in their markets. What will we be getting in 2020? Owners of digital audiences will need to assess and reassess their content and data strategies. How do you win advertising dollars when you’re competing against vast audiences, infinite inventory and incredibly deep audience data? Digital audience targeting is in its infancy today. More and more customer data will be harvested, tabulated, analyzed and made actionable. As a result, more and more ad dollars will be spent on reaching specific individuals on multiple web sites instead of buying ROS space on a particular web site. Already, Borrell Associates is predicting local spending on targeting banners will more than double in 2013, claiming a 32% share of local digital ad spending. Sellers of advertising will need to be relentless in adopting the latest targeting solutions for their customers. Media properties that hope to keep selling ROS banners in the world of “Where’s Waldo” targeting will be left in the dust. Honestly, I am not sure what the right audience-development strategies for local media will be as the amount of content expands geometrically. As I’ve said before, news alone will not be anywhere near enough for us to build the amount of audience engagement we will need. One thing I’m sure about, though, is that we need to be selling state-of-the-art targeting solutions to our local advertising customers. They need those solutions, and we can’t afford to get stuck receiving only the tiny share of ad revenues that publishers get from targeted advertising. We want to be getting the share that the sellers get, too. So finding a way to get ourselves into the “Where’s Waldo” game is hugely important. Posted on January 29, 2013, in Audience, Disruption, Media business model, Revenue, Uncategorized and tagged audience, Big Data, data growth, disruption, information growth, media, media business model, media disruption. Bookmark the permalink. 3 Comments. Steve, one more implication: for individuals, the problem of extracting from this ever-growing infotorrent the news and information you actually need and want will get increasingly important and increasingly difficult. The tools we now have for sifting and finding stuff are mostly pretty rudimentary and are not keeping up with the growth in channels coming at us. Essentially it’s a predictive search problem that remains unsolved. As people become micro-targeted, the principles of capitalism will be more pronounced. Considering that last year the advertising revenues collected by one company, Google, surpassed ad revenues of the entire print industry, the shift not only to digital, but to Google, could accelerate with a similar chart. They have the patents and legal force to keep others from trying. Plus, with their involvement in video, television, radio, and basically every other means of finding and befriending “Waldo”, it makes me wonder what their ownership share of ALL advertising revenues might be like in 2020. Apple and Facebook are the two biggest contenders. Unless several key patents expire, or other legal forces disrupt their business models, it wouldn’t be surprising if the Google, Apple, Facebook trifecta end up owning 95% of ALL global ad revenues spending through every form of advertising aside from the personal handshake. Somewhere out there, social engineers are considering ways to own that, too. Whoever figures it out will eventually get a nice payday from Google.